Marian Ellis Rowan (1848—1922) was an artist, naturalist and explorer. 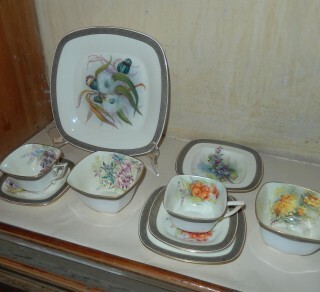 The collection at Saumarez Homestead includes china decorated with her designs. 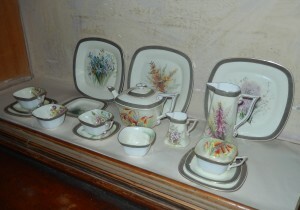 The Ellis Rowan China Collection is on display in the servery at Saumarez Homestead. 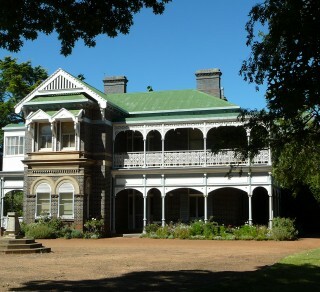 Visitors to Saumarez Homestead can only see the Ellis Rowan China while on a guided tour of the house. 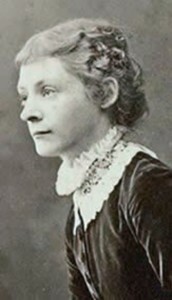 The Ellis Rowan Tea Set was originally given by Mr F J White and Mrs Margaret Fletcher White to Miss Frieda White as a wedding present when she married John Cullen. 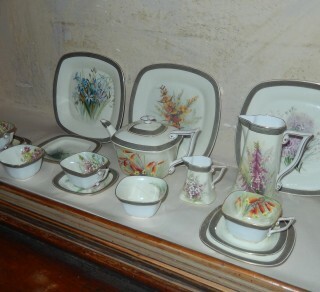 The Tea Set has been returned to Saumarez Homestead by Frieda’s daughter Mrs Anne Philp. 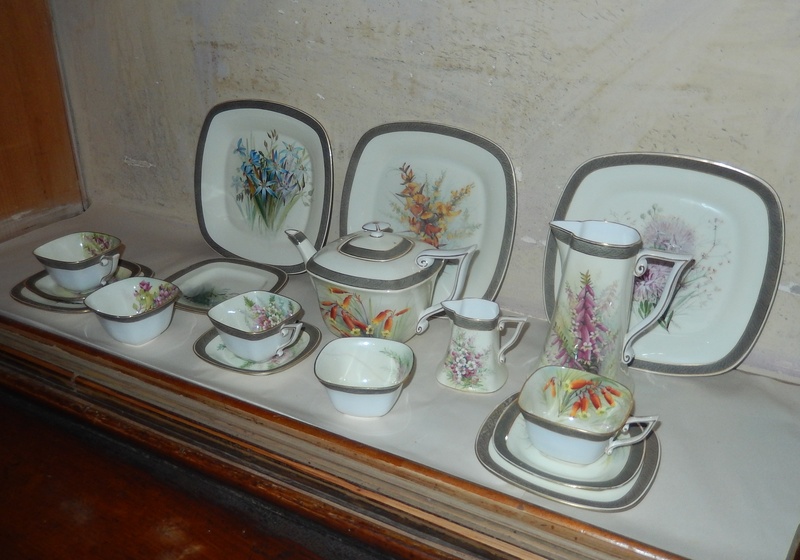 The beautiful demitasse cups and saucers have always been part of the Saumarez Homestead Collection . 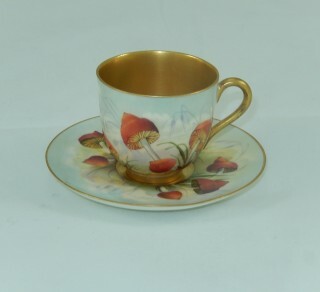 The Kookaburra cup and saucer has designs by Ellis Rowan but the Toadstool cup and saucer has designs by Phyllis Flockton Clarke. Description: Tea set, Royal Worcester fine bone porcelain china, consisting of teapot, four sugar bowls, two milk jugs, four square cake plates, five tea cups, five saucers and five bread and butter plates. The design is based on Australian flora and fauna watercolours painted by Ellis Rowan. 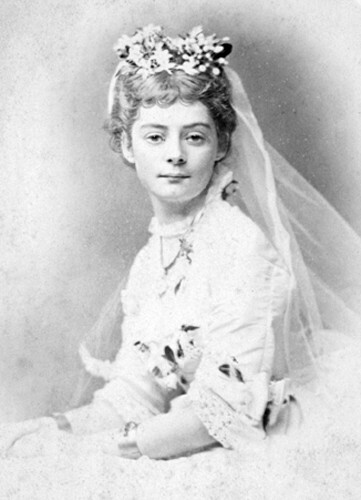 Provenance: Acquired by the Whites of Saumarez, inherited by Mrs Anne Philp, granddaughter of F.J. White, donated by Mrs Philp to the National Trust for Saumarez Homestead in 2005. 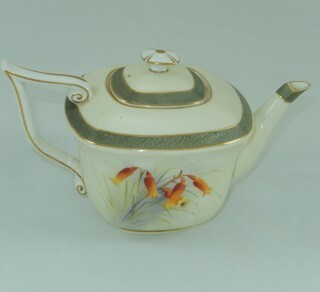 Description: Teapot is part of a Tea set, Royal Worcester fine bone porcelain china, consisting of teapot, four sugar bowls, two milk jugs, four square cake plates, five tea cups, five saucers and five bread and butter plates. The design is based on Australian flora and fauna watercolours. Design: 'Christmas Bells' marked on bottom; "The Mrs Ellis Rowan series'; 'Prouds Ltd'. Lid is marked the same. 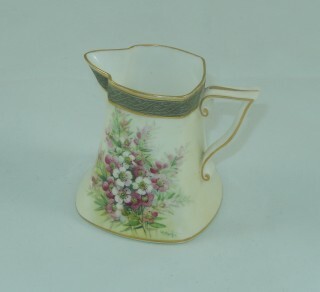 Description: Milk jug (one of two), part of a Tea set, Royal Worcester fine bone porcelain china, consisting of teapot, four sugar bowls, two milk jugs, four square cake plates, five tea cups, five saucers and five bread and butter plates. The design is based on Australian flora and fauna watercolours. Design: 'Leptospermum'. Marked: 'The Mrs Ellis Rowan series Australian flowers'; 'Prouds Ltd' on underside. 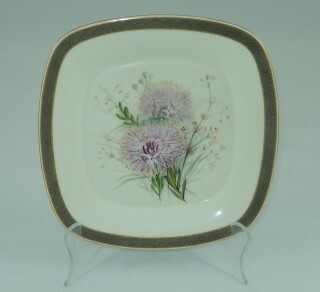 Description: Cake plate (one of 4) part of a Tea set, Royal Worcester fine bone porcelain china, consisting of teapot, four sugar bowls, two milk jugs, four square cake plates, five tea cups, five saucers and five bread and butter plates. The design is based on Australian flora and fauna watercolours. Design: 'Pymelia'. Marked: 'The Mrs Ellis Rowan series Australian flowers'; 'Prouds Ltd' on underside. 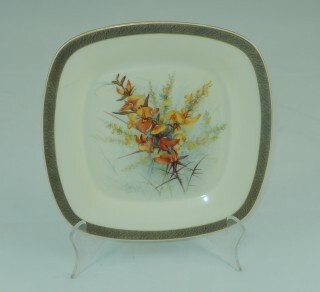 Description: Cake plate (one of 4) part of a Tea set, Royal Worcester fine bone porcelain china, consisting of teapot, four sugar bowls, two milk jugs, four square cake plates, five tea cups, five saucers and five bread and butter plates. The design is based on Australian flora and fauna watercolours. Design: 'Pultenea'. Marked: 'The Mrs Ellis Rowan series Australian flowers'; 'Prouds Ltd' on underside. 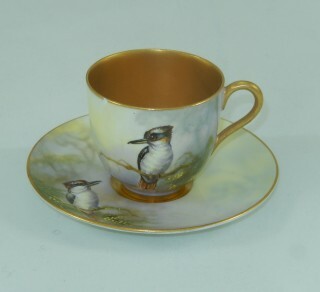 Demitasse Cup and Saucer "Kookaburra"
Description: Demitasse decorated with an image of a kookaburra on a branch. One of a pair of demitasses (four items in total), ceramic. Gilt lining and gilt handle, one is decorated with an image of a Kookaburra on a branch, the other with red coloured toadstool motif. Each saucer matches the corresponding cup. 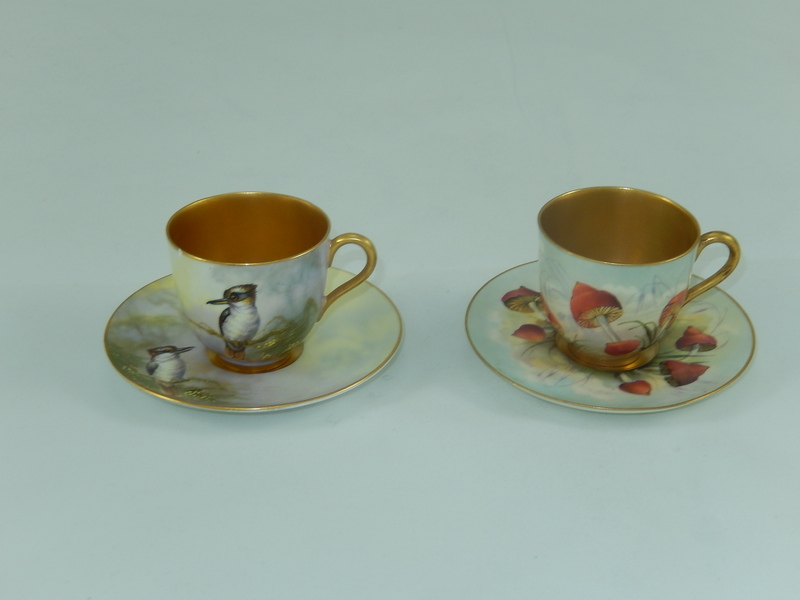 Flavelle Brothers firm in Sydney, each clearly stated as drawn by "P F Clarke"; in particular one is marked "8A"
Description: Demitasse decorated with an image of red coloured toadstools. One of a pair of demitasses (four items in total), ceramic. Gilt lining and gilt handle, one is decorated with an image of a Kookaburra on a branch, the other with red coloured toadstool motif. Each saucer matches the corresponding cup.